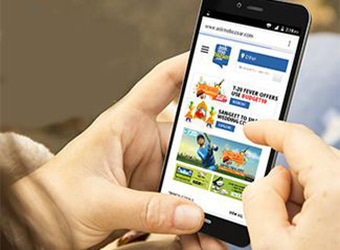 A fierce internal strife, mass pleas by desperate unpaid employees, cases initiated by duped sellers, volley of charges and counter charges between investors and management, theories of a suspected scam freely circulating on social media; the shutdown of e-commerce firm AskMe, incorporated Getit Infoservice Pvt Ltd has not only been painful but ugly and acrimonious too. After funds dried up and operations suspended, the key question that the 4,000 AskMe staff, 1,000 vendors on its platforms, the Malaysian digital media and telecom conglomerate investor Astro, the resigned chairman and MD Sanjiv Gupta and his team, the court and National Company Law Tribunal are dealing with is that who will pay the liabilities. As one of the exasperated employees wrote on Twitter, the warring investor and management of AskMe are playing Ping-Pong on the question of liabilities. 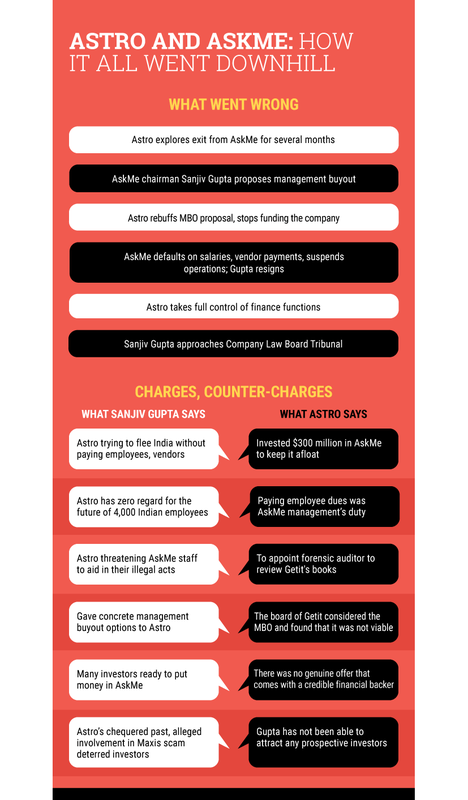 Sanjiv Gupta and his team argue that as a controlling investor with 98.5% stake, its Astro's responsibility to pay employees, vendors, and others. Gupta cites minutes of the board meetings to claim that Astro had agreed to pay them. The otherside â€“ Astro â€“ flatly rejects them. The investor categorically said it owed no further funds to AskMe and it squarely put the blame for not paying the employees and vendors on the management. Confused staff, irate sellers Even as the blame game continues, the people who suffer the most are the 4,000 AskMe staff and their families. "Our last salary was paid for the month May. From then, June, July, August salaries have been denied. We were waiting for our salary; there was no communication, but total confusion," one of the employees told TechCircle. "We haven't heard from them after that," said the first employee. While the blame game only intensifies, the employees are at a loss on who to talk to. "We are in a huge dilemma. We do not know whom to believe "the management or the investors. They both are blaming each other; both are right on certain aspects and wrong on many. We do not have any clarity as to what has happened," said the second one. While employees are depressed, confused and helpless, about 400 sellers whom AskMe owes money are livid; they sold goods on askmebazaar.com, askmegrocery.com, and mebelkart and are waiting for their dues. They approached the Economic Offences Wing. "Sellers trusted the company that they would maintain terms of contract. The contract authorised the company to collect money on sellers' behalf. This money was collected, but not reimbursed to sellers. Where was this money used? There are 300-400 affected sellers with an outstanding amount of up to Rs 150 crores," said a representative of the online seller's body. Their ire is directed towards the company management, not investors. "We are not concerned with AskMe's corporate set up or investor relations," he said. According to him, sellers approached Union commerce minister Nirmala Sitharaman who directed them to the Ministry of Corporate Affairs. The secretaries there asked them to approach the Enforcement Directorate. He said authorities were still trying to figure out how to deal with this. "It's so complex. At the end of the day, small time sellers suffer the most," he said. In the meantime, nobody is left in the company's leadership to respond to employees and vendors as Sanjiv Gupta and other top executives resigned in the second week of August. "I am completely out of it; left the firm two months ago," said Manav Sethi, the chief marketing officer of AskMe. Sethi was the spokesperson who used to speak to media on behalf of the management. MBO puzzle The problem of non-payment and other things need to be resolved and the bitterness between Astro and AskMe management would mean this could happen only through legal and governmental authorities. Astro already told TechCircle that AskMe would potentially go through a winding up process and a court-appointed liquidator may find the new owner for the company. This comes amid former chairman Gupta's forceful push for a management buyout. Gupta made multiple attempts to initiate a management buyout. Even BJP leader and Rajya Sabha member Subramanian Swamy jumped into the scene and shot off a letter to the Ministry of Corporate Affairs urging the government to assist AskMe management to buyout Astro's stake in the company. An Astro spokesperson has said his MBO offer was not viable. According to a person on the Astro side, Gupta's MBO offer wasn't really an offer but a demand to Astro to pay more. "Rather than quoting a fair valuation, he asked Astro to pay an additional $30-50 million as part of the MBO deal," the person said. When crosschecked with Gupta, he passed on a message through his communication person "The money referred to was part of the old liabilities which Astro has committed to pay in writing and is under the perusal of NCLT." A person in Gupta's legal team said: "The matter is before NCLT on that amount. It is not known whether it will go in our favour or their favour." NCLT on August 31 ordered to maintain statuesque and is set to convene the next hearing on October 17. Neither Gupta nor his associates disclosed the price they are willing to offer Astro for their stake in AskMe. Their first priority is to get this amount from Astro which it has refused. "No investor is interested to buy into AskMe with its debts. "They say 'clean your books first and then we will back you'," the person added. He insisted that rules suggested Astro holding 98.5% stake in the company should pay its debts. Neither Gupta nor his associates are forthright about their offer price but say they are open for negotiation on that front. "We have offered to negotiate on all clauses of the MBO to find a solution to revive the company several times," Gupta said. "We are very happy for an independent arbitrator to be appointed to help us execute the MBO to revive the company," he added. Yes Gupta clings on to MBO. Hopefully, Gupta will tell the world why the company did not gain traction despite investors putting in around $300 million so far. Also, Astro will need to say where they were till the entire nearly $300 million investment had gone down the drain. And they both should find a way out for the staff caught in the middle.